In the field of education teachers constantly seek creative new ideas to make the classroom more productive. Modern technology has long been a resource for up-to-the-minute classroom innovations. With each new technological tool, however, there are some questions as to its classroom appropriateness or effectiveness. Tablet computers are no exception. Educators have been using computers in class for decades now. Schools have whole computer labs with which to teach students the basics of computer use. Computers quickly became more of a learning tool than a class subject and schools across the nation have put desktop computers in each classroom. But providing each student with their own desktop is ridiculously inefficient, though the benefits are the stuff of a modern educator’s dreams. Laptops solve the problem of space and size, but are still cumbersome. Happily, the latest generation of computers, tablet computers, are even more streamlined, lightweight and portable, making it feasible to assign one to each student in a school. Predictably, many people question the suitability of tablet computers in the classroom. A tablet is only a limited resource without internet access. But many people are concerned about giving elementary to high school students such easy continuous access to the internet. The understandable concerns range from simple distraction to downright danger. Young students can discreetly listen to music, or be tempted to check their social networks when they should be researching a lesson. Additionally, more naïve students would be all the more accessible to online predators. The less mature the student, the greater the problems. There is some concern, additionally, about increased eye strain among young people who spend more and more time looking at computer screens. This makes teaching awareness and good work habits a priority. 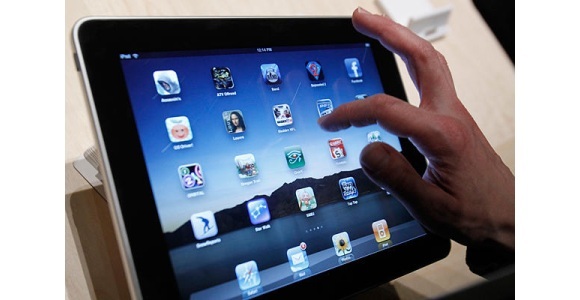 Using tablet computers in the classroom can create these and other concerns. But once educators learn to adapt to the challenges, tablet computers are a versatile and stimulating classroom tool. Applications on these devices allow for easier note taking. A student using a program like Microsoft’s OneNote can take notes in class on the tablet and access those notes from any computer that has internet access. Programs like Tegrity make it easy to capture entire lectures for future reference during after hour studies. Additionally, many textbooks are available in the form of ebooks, making it unnecessary to carry around multiple bulky books. On a tablet, textbooks come to life with the integration of audio and video enhancements. These elements engage and involve learners of every type. Classic literature in the public domain is easily found for free on the internet, further diminishing the bulk of books. Every class subject can benefit from the use of tablet computers. Art classes can access topical websites and use drawing programs that employ a stylus. Science classes benefit through virtual labs created for online science experimentation and research. Numerous web-based computer programs are capable of tutoring and guiding students by analyzing their work and giving helpful evaluations. High school students can benefit from a variety of test preparation applications including preparation for the SAT or ACT. School districts in Virginia, Texas, and Chicago, Illinois have exhibited enough success with the devices to warrant further implementation. Colleges are passing out the devices to all their students. Now that the learning possibilities inherent to the tablet computer have been tapped, students and teachers in the modern classroom have more ways than ever to be engaged and interactive with the learning process. About the Author – This article was written by Karl Stockton for the team at Keiser University Online. What’s So Great About The Raspberry Pi?